I have been thinking more about how to take forward my hedgerow library idea, and whether to leave the pages blank (similar in spirit to the River Library work of Racquel Rabonovich which inspired it), or whether to inscribe more knowledge upon them. I quite like the idea of capturing some sort of hedgerow folk knowledge – old wisdom, recipe, herblore or the like – using the paper which embodies directly the plant being discussed. I realise this leans slightly back towards the ritual magic of my old project proposal – well, some interests are ingrained I guess! As a way forward, I have been looking into historical written languages as well as the asemic, content-less forms. I started with the two scripts I know from Northumbrian folklore – namely Runes and Ogham, both native and isolated to Northern Europe. During my exploration, I discovered some very interesting facts about Ogham script. 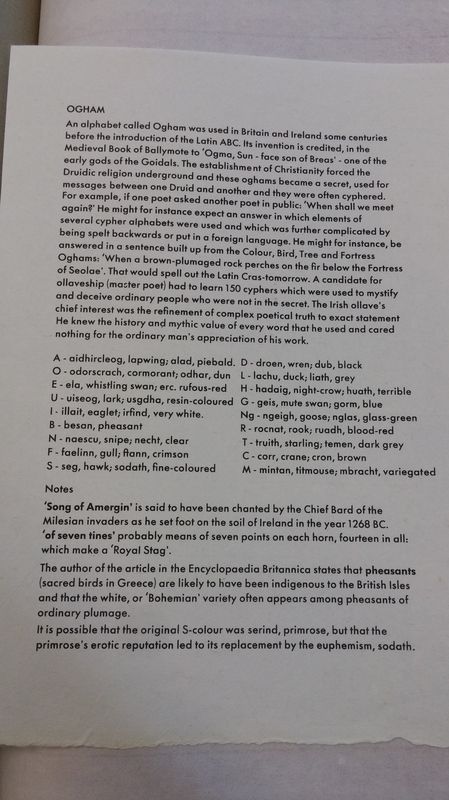 Used as an alphabet (not a language), it was used around the 4th century AD to write old Irish (mainly) as well as old Welsh and Pictish, through carvings on wood and stone monuments across the British Isles. It is thought that the script was designed as a code to write secret messages between people (some sources claim it was reserved for use by senior members of the Druids, so ordinary folk would not understand). I discovered an exquisite book in the library special collection which used the basis of Ogham as a code to create a limited edition artists book. Here are a few photos of the pages themselves – so beautifully done. I quite like how these have come out, and although still just tests, this could be a valuable strand of work to follow up. An outstanding question springs to mind though: do I want these stitched messages to be pure expression? or do I want to create some deep and involved cryptographic stitched script? I want to beware crossing the line into over-literal and over-baked ideas. …and where to go next? 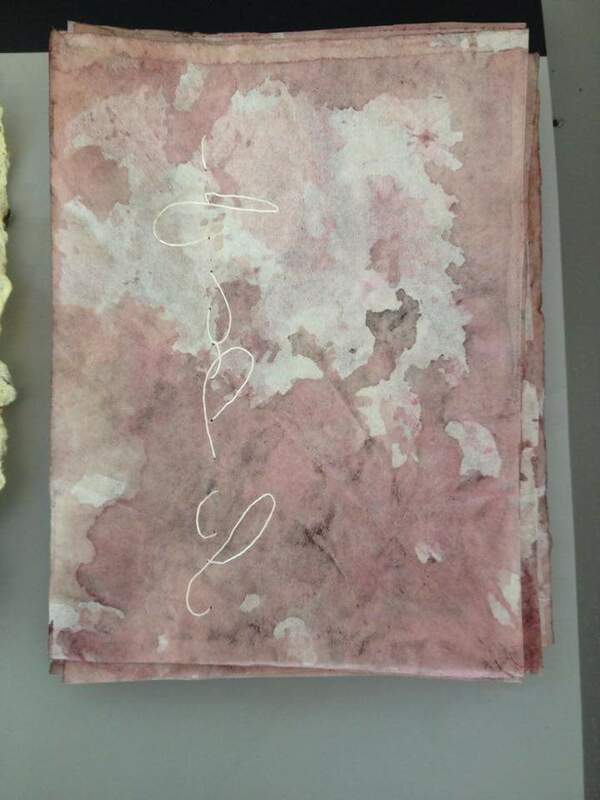 This entry was posted in 03.5 Unit 1 experiments, 04.3 Materials and process and tagged language, mark making, ogham on 28 May,2015 by antalbot.